Don’t be a heel! Check your soles! It is important we treat our Hartrue (clay) courts gently. One way to do this is to wear proper shoes. If you have any questions, the photos below should help you decide. Our pro Sam Williams will be selling proper footware in the Pro Shop. In addition, we have made an arrangement with The Barn in West Newton. They will give any Neighborhood Club member a 10% discount on appropriate tennis shoes! 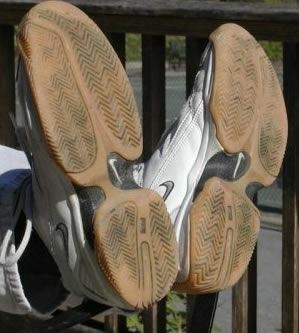 According to our Tennis Chairs, the shoes shown are NOT ACCEPTABLE for play on our clay courts. 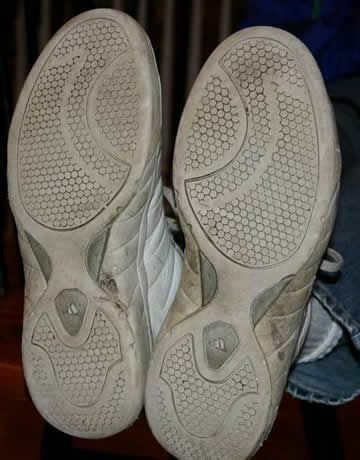 The fact that the heel region and the front region are disconnected will cause undue strain on our Hartrue courts.